↑ "Pope Francis (方濟教宗)". BBC. 2013年3月13號. ↑ Rice-Oxley, Mark (13 March 2013). "Pope Francis: the humble pontiff with practical approach to poverty （方濟各教宗：踏實對付貧窮嘅大佬）". The Guardian (UK). 喺13 March 2013搵到. ↑ Donadio, Rachael (2013年3月13號). 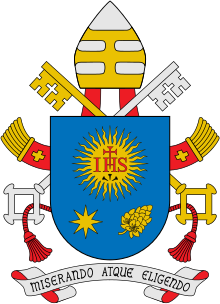 "The New Pope: Bergoglio of Argentina （新教宗：阿根廷人伯戈略）". 紐約時報. ↑ "Pope Francis: 13 key facts about the new pontiff （方濟各教宗：你要知佢嘅十三樣嘢）". 衞報. 2013年3月13號.